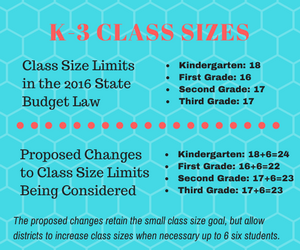 The conventional wisdom on K-3 class size is that smaller is better. That was the thinking used when the General Assembly passed its budget last year with a section that limited class sizes for grades K-3 starting with the 2017-18 school year. But like any conventional wisdom, there’s caveats and unintended consequences. Despite the criticism they’ve received for several legislative changes related to education, the elected officials on Jones Street are trying to build success into the state’s education system, and the class size limitation is one of those efforts. Unfortunately, the unintended consequences resulted in an un-funded mandate that would require thousands of new K-3 teachers in public schools across the state, and more than 400 teachers in the Wake County Public School System alone. WCPSS does not have the actual classrooms for these 400 new elementary classes, nor do the certified teachers for these classes exist. A bill to correct this was approved by the House Education Committee last week and is expected to pass the full House and Senate in the next couple of weeks. Language was added that gives school districts the ability to exceed those limits by six students per class. This change means a kindergarten class could max out at 24 students, a first grade class could have up to 22 students, and a second or third grade class could each have up to 23 students. If signed into law, the changes will basically bring the class size limits in grades K-3 back to where they have been traditionally. This will mean there will be less additional spending for school systems this year. The changes won’t produce significantly smaller class sizes, however, and it sets up the debate about the merits of investing in smaller class sizes at all. Small class sizes, especially in early elementary school, have been proven to have positive outcomes for students which last throughout their school careers. Students are more likely to show mastery on standardized tests, read on grade level, and graduate high school. However, mandating small class sizes means hiring more teachers to get to an ideal number of students per class. The effectiveness of those teachers is not guaranteed, and the results end up mixed. The first, and still best, study of small class sizes was done 30 years ago in Tennessee known as the Student-Teacher Achievement Ratio (STAR) in which students entering kindergarten were randomly assigned to classes with up to 17 students and others were randomly assigned to classrooms with more than 25 students. The study tracked the students through the first few years of school, and then followed up with them after they had reached adulthood. The students in the smaller classes performed better and had a higher likelihood of lifelong success than their peers in the larger classes. Citing STAR and other studies as evidence, California and Florida have enacted very strict class size requirements in different ways. California enacted a law in 1996 and school districts moved quickly to reduce classes the next school year. Florida wrote class sizes into its state constitution in 2002, and allowed an eight-year phase in. California’s law reduced class size from 30 to 20 students, and cost over $1 billion to implement at that time. Many districts in the state moved to reduce class sizes immediately for the 1997-98 school year. Such fast implementation created a short-term problem in finding qualified teachers to fill the positions. A study by the Public Policy Institute of California found inexperienced teachers had a dampening effect on the potential gains. Florida’s attempt to reduce class size was phased in over eight years. School districts were encouraged during those eight years to reduce class sizes by two students per year, and Florida budgeted annually during that time to help districts hire more teachers. Beginning with the 2010-11 school year, K-3 class sizes were limited to 18 students, grades 4-8 could have up to 22 students, and high school classes were capped at 25. This effort cost Florida taxpayers $20 billion during the eight-year phase-in, and has cost an additional $4 billion to $5 billion per year to maintain. Despite its gradual roll out, all of this spending and effort had very little effect on student outcomes on Florida’s state tests known as FCAT, according to a policy brief by the Brookings Institution titled, “Class Size: What Research Says and What it Means for State Policy”. The study also found that the most significant improvements happened when class sizes were reduced by 7 to 10 students. Even then, the improvements were incremental, and they were diminished by fifth grade. When weighing the expense against the outcome, it raises the question of cost effectiveness. Are the outcomes worth the extra expense when tax dollars are limited and there are greater needs with better outcomes worthy of funding? Are there better ways to use state tax dollars to have a more significant effect? Those questions are difficult to answer on a statewide basis when North Carolina’s local education authorities differ so greatly in needs. Class size might not be as critical in WCPSS as it is in other parts of the state, while WCPSS may have specific funding needs that will improve outcomes in other important areas. So far, the General Assembly hasn’t committed any tax dollars to fund its smaller class size initiative, but local education authorities cannot pick and choose which laws to follow. The money must come from somewhere. In Wake, that may mean an increase in the property tax rate to increase revenue for the county government to pay for these additional teachers, but what is more likely to happen is a reduction in other parts of the school budget for teacher salaries. WCPSS would have to add more than 400 new teachers in grades K-3 next school year, according to school system estimates. Paying for that would mean eliminating other classes like art, music, PE, media, technology, and more. Few of these specialist teachers are certified to teach outside of their specialty even though they are elementary school teachers. So, this law would put several experienced teachers out of work while requiring the hiring of hundreds of new, and possibly inexperienced, elementary school teachers. These problems extend to every school district across the state, and superintendents have voiced their concerns to lawmakers, which is why the law is being revised in the long session. The bill to revise the law will allow local education authorities to exceed the statutory limits, but it still doesn’t include any additional funds to hire more teachers. The effort to reduce class size by statute is noble. Based on the data in the STAR study and multiple follow up reviews of the STAR data, smaller class sizes have a positive effect on student outcomes throughout their school careers. Couple that with the state’s Read to Achieve law which mandates all students will be reading on grade level by the end of third grade, and North Carolina is taking the first steps in the right direction of a long journey to improved student outcomes in K-3 and beyond. The mistake to this approach is doing it in pieces as part of the budget bill every year. A piecemeal approach isn’t going to work, and it will result in unintended conflicts and increase competition for dollars in stagnant education budgets. The General Assembly’s initiatives cannot be successful unless they are part of comprehensive plan which includes timely program evaluation to make sure the taxpayers are getting their money’s worth. Simply force-hiring more teachers isn’t going to improve outcomes, and it will reinforce the “good money after bad” mantra about public education when the results of class size reduction aren’t as significant as expected. The schools will be blamed for failing on yet another score when they weren’t given the resources they needed to be successful in the first place. The proposed changes to class size limits will basically give the local education authorities the same limits that existed before the budget was passed last summer. It’s meant to be a short-term fix to prevent costly unintended consequences. A long-term solution is needed instead, and it shouldn’t be a single statewide mandate applied uniformly across all 115 local education authorities. Ideally, true transformation to public education would be dealt with more deliberately through separate legislation instead of by adding policy pieces into the budget. Bills should be aimed at updating existing laws and writing new statutes with the intent of giving public schools the resources and flexibility to be innovative. One particular bill could create a new method of funding public education through an application program for additional funding based on local needs. School districts which, through their own strategic planning processes and school improvement plans, have identified specific and measurable areas of improvement should be able to submit plans to the Department of Public Instruction for funding. For example, in school systems where reducing class sizes is a top priority for student achievement they could request additional state funding to carry out their plans. Similarly, school systems which would rather commit resources to Career Technical Education (CTE) programs to ensure their students are workforce-ready upon graduation should be permitted to seek additional state funding to implement those programs. Those are just two of many examples. Transforming education in North Carolina should not be a process of inserting into the budget major individual changes with statewide weight and impact. Instead the process should allow for stakeholders to participate in drafting and improving bills which result in sound education initiatives. The goal of such legislation should be to inspire school districts to innovate based on their local needs. Class size reduction is a noble goal, but when compared to other unique pressing needs in school systems around the state, it is not best solution for everyone.